Lessons learned from dealing with extreme weather over the last few winters has seen the UK’s largest telephone and broadband network invest in record amounts of stock this year to keep its engineers on the road. So far the seasonal shopping list includes: 78,000 kilos of rock salt; 1,500 snow shovels; 6,300 ice and snow grips for footwear; 2,050 sets of snow socks for van tyres; 27,800 litres of screenwash; 29,700 half litre de-icer sprays; and 3,550 kilos of salt solution for de-icing frozen manholes. 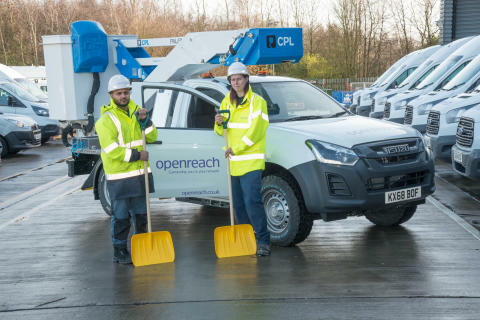 Openreach’s Director of Operations in the North West, Paul McGinlay said: “We’ve been working to minimise the potential for disruption as we head into the season which brought us heavy snowfall followed by the ‘Beast from the East’ last year. “We’ve been stocking up on essentials like ice grips for shoes so that the UK’s largest team of engineers can keep working whatever the weather, to maintain our phone and broadband network and continue with our ambitious programme to roll-out fibre broadband across the country. As well as stocking up on supplies, Openreach has placed increased focus and investment in geographic hotspots which have proved susceptible to storms and wild weather in recent winters. A fleet of 100 4x4 vehicles has been strategically placed around the UK to reach isolated communities quickly. The winter readiness plans will be supported by a record level of recruitment. Across the North West, more than 3,400 people are employed by Openreach, most of them engineers. And that team is expanding, after it was announced last year that more than 280 new engineers are being recruited. Openreach provides the telephone and broadband network used by hundreds of service providers such as Sky, TalkTalk and BT. Its fibre broadband network is the biggest in the UK, passing more than 27 million premises. Anyone spotting any damage to the Openreach network following bad weather this winter, like loose, snapped or dangling cables, damaged telephone poles or missing manhole covers, can report it by calling 0800 023 2023.